That's right! It's been a year since that completely nerve wracking and life changing day when I officially joined the ranks of designers at JessicaSprague.com! One year! Can you believe it? I hardly can. It's been a whirlwind of a year with so many amazing experiences. I have learned so many things about the design biz, people around me, and most of all myself that I am sure would have never known otherwiese. It's been demanding and humbling to learn how much work it takes, and about the never ending things to learn about graphic design, colour, and digital scrapbooking. I have been amazed, awed, and deeply touched by the beautiful creations of all the lovely people who have used my designs. So what better way to say thank you, and to pat myself on the back for daring to take a leap of faith, than to party? Heck yeah! I've got several goodies lined up for you today! Let's start off with new products in the shop! I have not one, not two, but three new products available in my shop today. Heck yeah! This series of packs is all about me going back to my roots. I think I have shared a few snippets about being in a creative slump for a while? I needed to go back to the stuff that I really love to find a glimpse of it again. First, the colours! Blues, browns, tans; they are all my favourites. They make me feel calm and serene, refreshed and warmed at the same time. Also, I think they are just plain pretty. Then, greeting cards, invitations, card making; that's what started me on this whole journey to begin with all those years ago. So this whole series is devoted to my first loves. There is one more part of the series coming next week (a card templates pack, but ssssccchhh don't tell anyone). I hope you will love them all as much as I do. Meet & Greet is available, surprise surprise, today! 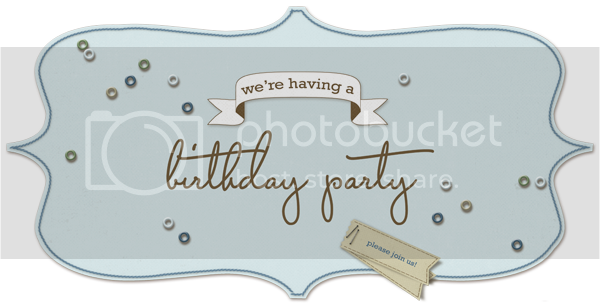 And what would a birthday party be without a giveaway? Why nothing I tell you. So guess what, we're having a giveaway! Heck yeah! One lucky dog will win all of the above packs. Heck yeah! All you have to do is reply to this post and tell me what you would like to use them for. Please post on Wednesday at the latest for a chance to win. The winner will be announced on Thursday. But what about everyone else, you ask? Don't worry loves. I've got your backs too! Heck yeah! Head over to my facebook page, click the like button (if you haven't already), and check out the action on the wall. I don't think you will be disappointed! But don't wait, you've only got three days to get in on the action. Important edit: I am sorry for the confusion! With action I meant stuff going on, not Photoshop actions per se. I am sorry if you got all excited and were deeply disappointed because of my inability to communicate correctly! All I have to say for myself is that I am Swedish after all! Alright my loves, time for some cake! Go ahead and have one you too on my behalf! I love blues, tans and browns too and would be inspired to create hybrid cards with your lovely papers and wordart, thanks! Congratulations on your anniversary! Love your new kits. I think I would put them to use making an album for my father in law's 80th birthday party that I still haven't gotten around to scrap. I am so very happy that you took the leap! You are an amazing designer & your stuff has just the right amount of clean lines & fab colors & a bit of grunge to make it fabulishious! Congrats on your 1st year & I hope to see many, many more! Congrats, Linda! I loved reading about your journey this past year! Thank you for sharing your creativity and inspiring designs. Congratulations, Linda! Your products are AMAZING! Happy anniversary Linda! This kit is gorgeous! My husband is celebrating his 40th birthday this year so this would be perfect for a mini album. Congratulations! I would love to use those products to make a bunch of hybrid cards for all my nieces and nephews! Thanks for the chance! I have been in a slump for about a year now. I woke up one day and just couldn't boot up Photoshop. But this week I opened it up! I would love to use them to get back to work, I have a years worth of photos in need! I would love to use these to scrap some baby pictures of my boys! Congratulations on your first anniversary! Love the soft colors of the blues and tans and browns also. I would use the supplies on scrapbook pages mainly for my grandsons, also for cards, and hybrid projects. Would love to use this for beach photos. Congratulations on your anniversary! I also love the softer blues and browns. I have several of your kits already. I would be inspired to finally scrap that trip to Alaska we took in 2009! Next month we are taking a cruise for our 50th anniversary and the papers would make the perfect background for island color embellishments to pop. Gorgeous kit and so versatile. Let me see... heritage, grandson, holiday pics, cards and.. I could use them in many ways. Congratulations on your anniversary. So glad you joined JS. Congratulations on your anniversary, and thanks for inviting us to celebrate with you. Your kits are awesome. These colours would be fabulous for scrapping my little boy LO's, amongst just about everything else. Love the colours. I think I would use them to make birthday party invites for my daughter that turns 7 next month.